Over the past decades,hundreds of thousands of large-hearted Westerners—eager to fill out their families while helping a child in need–have adopted from poor and troubled countries. In many cases—especially in adoptions from China or former Soviet bloc countries—these adoptions were desperately needed, saving children from crippling lives in hard-hearted institutions. But too few Westerners are aware that in too many countries, there’s a heartbreaking underside to international adoption. For decades, international adoption has been a Wild West, all but free of meaningful law, regulation, or oversight. Western adoption agencies, seeking to satisfy consumer demand, have poured millions of dollars of adoption fees into underdeveloped countries. Those dollars and Euros have, too often, induced the unscrupulous to buy, defraud, coerce, and sometimes even kidnap children away from families that loved and would have raised them to adulthood. 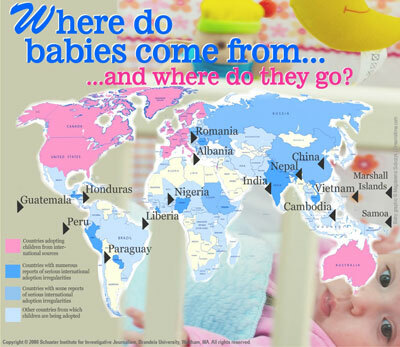 Many publications, reporters, broadcasters, and bloggers tell stories about what’s right with international adoption. As an investigative reporting institute, we feel an obligation to speak for those whose stories have not been told. And so our Institute has been investigating what can happen when things go wrong, and why. We hope that this information will be useful to concerned citizens and policymakers. Below are brief descriptions of, and links to, all the pieces in our series released so far. "Finding Fernanda: Two Mothers, One Child, and a Cross-Border Search for Truth," Erin Siegal, May 8, 2012, Beacon Press. Guatemala Court Revokes Passport, Asks for Return of Child Karen Abigail. Following her extensive investigation, Schuster Institute Fellow Erin Siegal reports on the sad and twisted drama of the allegedly stolen child Anyelí Liseth Hernández Rodríguez, kidnapped in November 3, 2006, and Karen Abigail, adopted from Guatemala to American parents in Missouri. ﻿"The Makeni Children," August 9, 2011, Slate.com. The international adoption of 29 children from Sierra Leone to the West in 1998 occurred during a civil war. Adoptive parents believed they were rescuing orphans. But the birth families say they've been searching for the children ever since. What happens when it appears that international adoption hasn’t saved an orphan—but, rather, created one? Can justice be done? In a riveting three-part series, E.J. Graff investigates the stories of two children adopted during Sierra Leone’s civil war in 1998. Thirteen years later, their American adoptive families—who had believed they were rescuing orphans—learned that birth families were still searching for those children. Graff sheds light on the adoption process and what went wrong. In what may be the first time anywhere, she takes readers through every stop along the chain: birth families, adoptive families, an adopted child, a government official, and the responsible adoption and child welfare agencies. Part III: How Flawed is the International Adoption Process? ﻿In "The Stolen Makeni Children," (May 11, 2012, Slate.com) Graff revisits the story of the Makeni children in Sierra Leone. In April 2012, the Sierra Leonean government shut down and launched an investigation into HANCI, the child welfare organization that placed the children for adoption, saying the biological families “cannot be said to have genuinely consented.” After 14 years, will the Makeni families be reunited? "Anatomy of an Adoption Crisis," ForeignPolicy.com, September 12, 2010. The article reveals how determined the U.S. Embassy in Hanoi was to block fraudulent or corrupt adoptions—and how little power it had to do so. "The Baby Business," policy proposals for fairer international adoption practice, Democracy Journal, Summer 2010. The United States needs improved policies, practices, and regulations that help prevent the criminal underside of the adoption trade—as well as support systems to help poor families and disrupted communities keep their children home. Already in place are a treaty, a law, sets of regulations, and a host of aid efforts on behalf of children. But significant gaps remain. Plugging some important holes, outlined here, would go a long way toward saving children from being wrongfully taken from their birth families, and saving Americans from discovering they unwittingly paid someone to buy them a child. Experts respond: Symposium of writings by researchers, leaders, and policymakers in international adoption in response to "The Baby Business." "The Lie We Love": exposing the world orphan myth, Foreign Policy, November/December 2008. The story of abandoned or orphaned infants and toddlers in developing countries who need to be whisked away to adoring moms and dads in faraway lands is, unfortunately, largely fiction. So writes E.J. Graff, associate director and senior researcher at the Schuster Institute in her award-winning investigative article "The Lie We Love," published in Foreign Policy's Nov./Dec. 2008 issue. The article exposes the myth of a world orphan crisis—and reveals that the disproportionately large amounts of Western money offered in poor or corrupt countries can too often induce unscrupulous middlemen to buy, coerce, defraud, or kidnap children away from families that would have raised them to adulthood. The article has received four prestigious journalism awards: the Society of Professional Journalists’ 2008 Sigma Chi Delta Award in Journalism for the Best in Magazine Investigative Reporting; 2008 James Aronson Award for Social Justice Journalism, the 2009 Clarion Award for Best Magazine Feature Article; and the 2009 Casey Medals for Meritorious Journalism honorable mention for Magazine Reporting. "The Orphan Trade: A look at families affected by corrupt international adoptions," Slate.com, May 8, 2009. "The orphan manufacturing chain," How does the money change hands in ways that transform a child with a family into a paper “orphan” for adoption? "Out of Cambodia," In 1999, a child finder was paid $300 to recruit Songkea, a 9 or 10 year-old Cambodian girl, for adoption. In 2004, she and her adoptive mother visited her biological family for the first time in 5 years. With pictures. "The Adoption Underworld" was selected as the 2010 Clarion Award Winner for Best in Newspaper Feature Articles. "Don't Adopt from Ethiopia," E.J. Graff, May 3, 2012. "International Adoption or Child Trafficking?" E.J. Graff, January 6, 2012. "Lies, Damn Lies, and Adoption," E.J. Graff, November 11, 2011. "Adoption Fraud in Guatemala," E.J. Graff, September 29, 2011. "Adoption is Not a Solution for Poor Children," E.J. Graff, September 22, 2011. "Adopting new standards on adoption," E.J. Graff, "Comment is Free," Guardian.co.uk, September 10, 2010. "Preventing adoption disasters," E.J. Graff, The Boston Globe Op-Ed, April 17, 2010. "Haiti's Children and the Adoption Question" NYTimes.com "Room for Debate" opinion blog, February 1, 2010. "Celebrity Adoptions and the Real World" NYTimes.com "Room for Debate" opinion blog, May 10, 2009. "The problem with saving the world's 'orphans'," The Boston Globe, December 11, 2008. Over the past two decades, serious irregularities in international adoption have been documented in a variety of publications and broadcasts around the world. Until now, these individual reports and stories have never been pulled together so that prospective parents, adoption industry experts, opinion leaders, and policymakers can look at them in a systematic way. Click on our interactive map to find documentation of adoption abuses in a number of countries, including links to original news reports and academic research. be notified when we update this portion of our website.